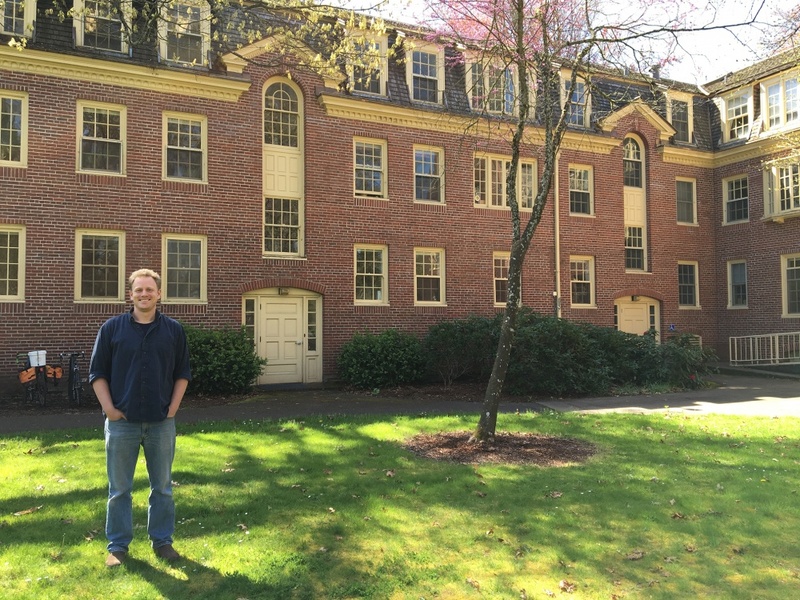 University of Oregon graduate student Jon LaRochelle has been examining the hot-button issue of homelessness through the lens of power through community activism, work that will be boosted after LaRochelle received one of this year’s Graduate Research Fellowships. LaRochelle is one of 25 UO graduate students to receive fellowships or research awards from the University of Oregon Graduate School for the 2016-17 academic year. These awards, most of which are donor supported, range from $500 to $18,000 per year and, in some cases, include tuition support. A student in the Department of Philosophy, LaRochelle received the Eric Englund Research Fellowship, designed to support doctoral students whose research is in American literature, history, philosophy or other related fields. LaRochelle’s project draws on American philosophy — especially pragmatism — to explore a novel conception of power. As a recipient, he will receive an award stipend of up to $18,000 to continue his research. “Homelessness is a complex and textured local issue affected by broader economic and political relations, tied to the unique character of the city and infused with a plurality of conflicted power relations,” LaRochelle said. This year the Graduate School expanded the Dissertation Research Fellowships from one award last year to 12, including school- and college-funded awards and a brand-new fellowship supported by a bequest from UO alumnus Eric Englund. UO Dissertation Research Fellowships are designed to support outstanding doctoral students and promote excellence in research at the University of Oregon. Another fellowship, the UO Doctoral Research Fellowship, went to Sripoorna Paniyadi Krishna Bharadwaj from the Department of Physics. Bharadwaj’s work seeks to understand fundamental properties of quantum ferromagnets. This fellowship is awarded to the most outstanding doctoral student at the University of Oregon as determined by a faculty selection committee. The fellowship carries an award stipend of $18,000 and a university tuition waiver. Cem Kayatekin, architecture, School of Architecture and Allied Arts. Sara Pacchiarotti, linguistics, College of Arts and Sciences. Iris Peng, East Asian languages & literatures, College of Arts and Sciences. Paul Downen, computer & information science, College of Arts and Sciences. Alexander Bies, psychology, College of Arts and Sciences. Steven Leone, history, College of Arts and Sciences. Klaree Boose, anthropology, College of Arts and Sciences. Spirit Brooks, critical & sociocultural studies in education, College of Education. Jeffrey Xie, marketing, Lundquist College of Business. Esi Thompson, media studies, School of Journalism and Communication. For a full list of this year’s award recipients, visit the University of Oregon Graduate School’s award recipients web page at http://gradschool.uoregon.edu/.